ICE NGX is the clearinghouse for all cleared transactions in the ICE NGX markets and ICE’s US physical gas and power markets. In this role, ICE NGX maintains a secure and efficient clearing operation, managing various risks across market participants and products. ICE NGX acts as the central guarantor for all cleared transactions, acting as the buyer to every seller, and the seller to every buyer. All collateral segregated and for owner usage only. Since each participant (“Contracting Party”) agrees to make ICE NGX the counterparty to the transaction, the Contracting Parties collectively look to ICE NGX to manage risks to the ongoing operation of the clearinghouse. ICE NGX is committed to ensuring the security and integrity of the clearing operation. ICE NGX does not enter into transactions nor take positions in energy products for any reason other than to provide clearing services. 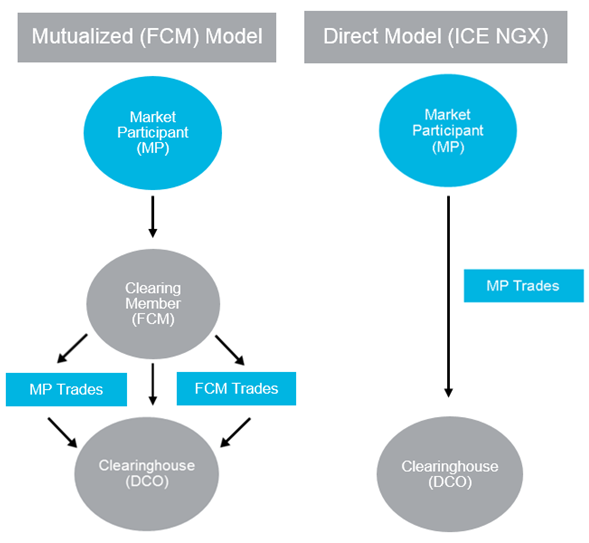 ICE NGX operates a non-mutualized, direct clearing operation, whereby all market participants clear directly without the mediation of a third party clearing member. In order to secure the clearing operation against the failure of one or more Contracting Parties, several contingencies make up ICE NGX’s clearing structure. Margin requirements are calculated to determine the estimated cost of liquidating a Contracting Party portfolio if required in a default scenario. Margin requirements include unpaid receivables for delivered product, mark-to-market and initial margin on forward positions, as well as additional margin as deemed necessary to ensure that the clearinghouse can effectively manage a Contracting Party’s failure to perform their obligations if ever required. In the event of a failure to perform on physical delivery, ICE NGX has the ability to backstop and provide alternate supplies or markets for physical natural gas. In the event of a failure to perform financially, ICE NGX may draw on collateral that has been deposited by the defaulting party in support of their margin requirement. Collateral deposited by Contracting Parties may only be used to remedy a performance failure on the part of the Contracting Party who failed to perform. ICE NGX does not mutualize this performance risk across the collective group of Contracting Parties. The ICE NGX Guarantee Fund is comprised of a USD $100MM letter of credit issued by The Bank of Nova Scotia and held in trust by BNY Trust Company of Canada accessible to Contracting Parties through the Contracting Party Agreement (CPA). ICE NGX’s Guarantee Fund is further backed by Export Development Canada (“EDC”) insurance. ICE NGX also maintains various credit facilities and additional liquid resources to ensure that, at a minimum, all regulatory liquidity provisions are maintained.